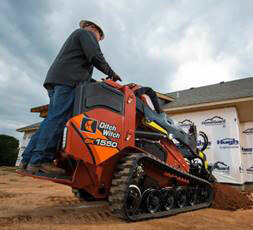 Ditch Witch introduced the SK1550, the company’s largest mini skid-steer model to date. The SK1550 is powered by a 44-hp, Tier-4 Yanmar diesel engine and directs 34.5 hp to the attachment. Equipped with a 94-inch hinge-pin height, the SK1550 also provides operators flexibility for loading and unloading material on a wide range of dump sites, the company said. The SK1550 offers a 1,558-pound rated operating capacity and is equipped with a 4.7-mph ground drive speed, in forward and reverse. The model’s 74-square-inch ergonomic operator platform comes standard with dual-lever ground drive controls, allowing the operator to independently control each track. An optional, single joystick control is also available.